Fellowes Platinum/Graphite Standard Monitor Riser features a high-impact plastic design that can conveniently accommodate 21-inch monitors up to 60 lbs. 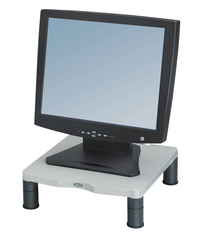 Monitor raiser has a width of 13-1/8 inches, depth of 13-1/2 inches, and the stacking columns provide up to 3 height adjustments from 2-4 inches for viewing comfort. This raiser comes with non-skid rubber feet and has excellent cord management features.